Jenny DiGioia - Bay State Physical Therapy. Jenny DiGioia graduated from Northeastern University in 2008 earning a Doctorate in Physical Therapy. Throughout her clinical and professional work, Jenny has gained experience working with a variety of clientele requiring restoration of function post-surgery, acute injury and chronic pain management. 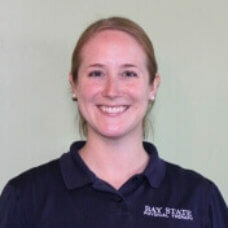 She has been with Bay State Physical Therapy for over 10 years. Her treatments include patient education, manual techniques, developing comprehensive therapeutic exercise programs, neuromuscular reeducation and aquatic treatment. Currently, Jenny’s interests lay in orthopedic therapy focusing on sports medicine. Jenny aims to make each individual’s physical therapy experience fun and educational while improving their quality of life. In her spare time, Jenny enjoys spending time with family and friends, reading and traveling.